In the tradition of iconic films such as “Sophie’s Choice,” “Shoah,” “Schindler’s List,” and “The Pianist,” the Claims Conference, by launching this competition, aims to encourage a new generation of directors to tackle the Holocaust as a subject matter in their work and to use their creativity and skills to portray new perspectives and observations about a dark era in human history. 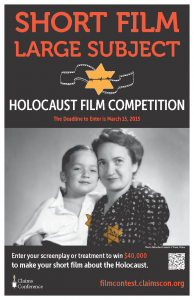 The Claims Conference has launched “Short Film, Large Subject: The Holocaust Film Competition.” This is the organization’s first film contest, open to students currently enrolled in graduate-level film schools or recent graduates from accredited programs. The competition is open to entrants from around the world. Recognizing the potential of movies to reach large numbers of people and to spark powerful discussions among audiences, the Claims Conference is putting out a call for talented, rising filmmakers to submit screenplays or treatments for short films about the Holocaust. The winner of this short film contest will receive a prize of $40,000 toward the production of a 20-minute short. Information about the competition, rules and entry form are at filmcontest.claimscon.org. Separate from the competition, the Claims Conference distributes grants for selected projects and programs of Holocaust education, documentation and research. Among recent grantee films is the theatrical release “No Place on Earth.” This work raises public awareness about the Holocaust and preserves the evidence of it; the funding of these projects will be even more critical when the eyewitnesses are gone. For more information, see www.claimscon.org/red.